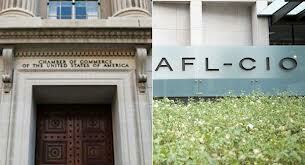 Talks led by the U.S. Chamber of Commerce and the AFL-CIO over a new guest-worker program for lower-skilled immigrants are stalled, prompting members of the bipartisan group of eight senators to get personally involved to try to nudge the negotiations toward a resolution. Business and labor groups have been meeting for weeks in an attempt to put together a system that would allow employers to find foreign labor when American workers are not available and that would allow foreign workers into the country. The idea is to create a new “W” visa category for lower-skilled guest workers. No such visas exists right now, leaving a vacuum that undocumented workers have been filling.